Kids love making and eating pizzas, but this is a version that you and they may not have come across before. 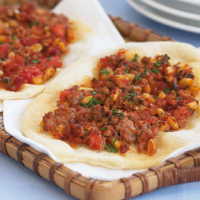 Lebanese 'pizzas' are baked just long enough to cook the dough through, but leave it soft enough to fold up. A mixture of aromatically spiced minced lamb or beef with tomato and pine nuts replaces the familiar tomato and cheese topping. The result is something quite different, and extremely delicious. We always end up eating far too many. For the dough, mix the flour with a few pinches of salt, the sugar and yeast and make a well in the centre. Add the oil and enough warm water to make a soft dough. Knead for about 10 minutes, dusting lightly with flour if it is too sticky (far better than being too dry), until the mixture is satin-smooth and elastic. Place in an oiled bowl, turn to coat in oil, then cover with clingfilm and leave in a warm place until doubled in bulk, about 1-1 ½ hours. Leave the chopped tomatoes in a sieve to drain. Fry the onions gently in the oil until tender. Drain briefly and cool, then mix with the tomatoes and all the remaining ingredients, breaking up the mince. Punch the risen dough down and knead for a couple of minutes. Take golf-ball size pieces and roll out thinly. Smear each one generously with the topping and lay on oiled baking sheets. Bake the pizzas for 7–9 minutes per batch, but don’t let them brown. When they come out of the oven they should still be soft enough to roll up and eat. Serve immediately with a salad.